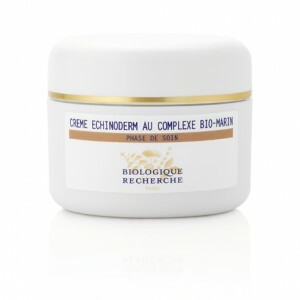 Crème Echinoderm au Complexe Bio-Marin treats unbalanced and blotchy complexions that lack tone. This stabilising treatment cream will balance the skin, unify the complexion, refine the skin texture, and rejuvenate it, whilst its yeast compound will gently purify it. It is extremely energising and revives even the most fragile of skins, as well as mattifies them. Tired, stressed Skin Instants® with blotchy complexion. Ideal for combination or oily Skin Instants®. Moisturising agent: Specific Bio-Marine Complex (containing Marine Collagen and Bio-Marine Tissular Extract). Toning agent: Specific BR Botanical Complex.